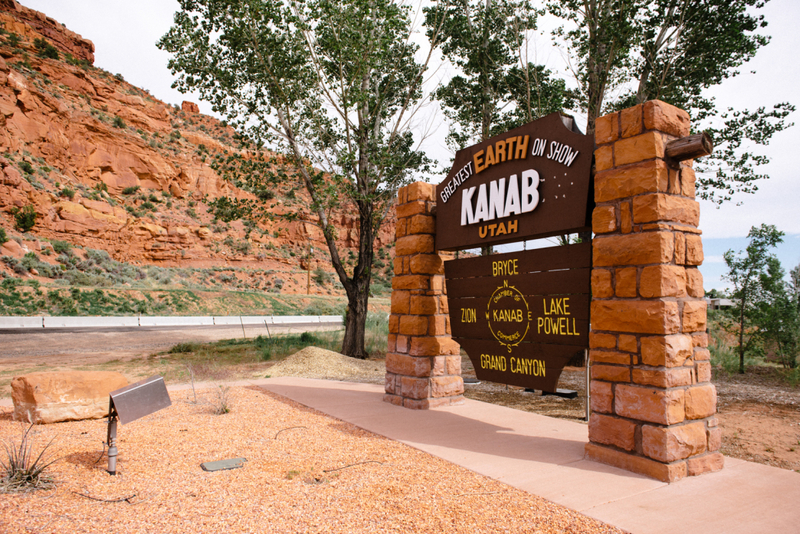 Moqui Cave is a landmark tourist destination and museum just north of Kanab 5.5 miles on scenic Highway 89. 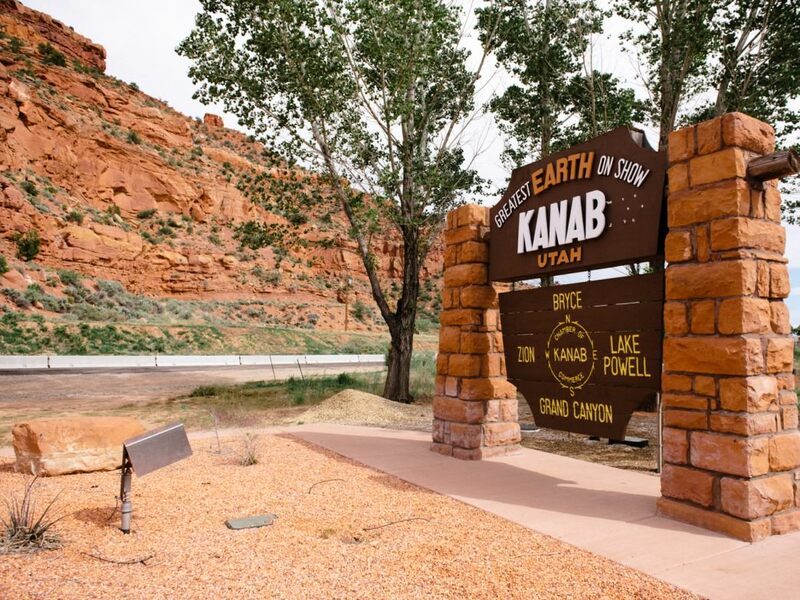 Appealing to spelunkers and beyond, Moqui Cave offers a quirky look at one family’s eccentric art collection and fascinating history, while also showcasing geological rarities found throughout Southern Utah. The word “moqui” is now commonly used to refer to the Hopi tribe of Native Americans who inhabited the region centuries ago. In 1951, Garth Chamberlain bought this cave, which was then in disrepair. He put to task to make a one-of-a-kind tourist destination and performance hall. After renovation, he built a stage, which was used for socials and dances, and a tavern with a bar—still there, but not serving drinks. It was a regular hootenanny in this subterranean spot. 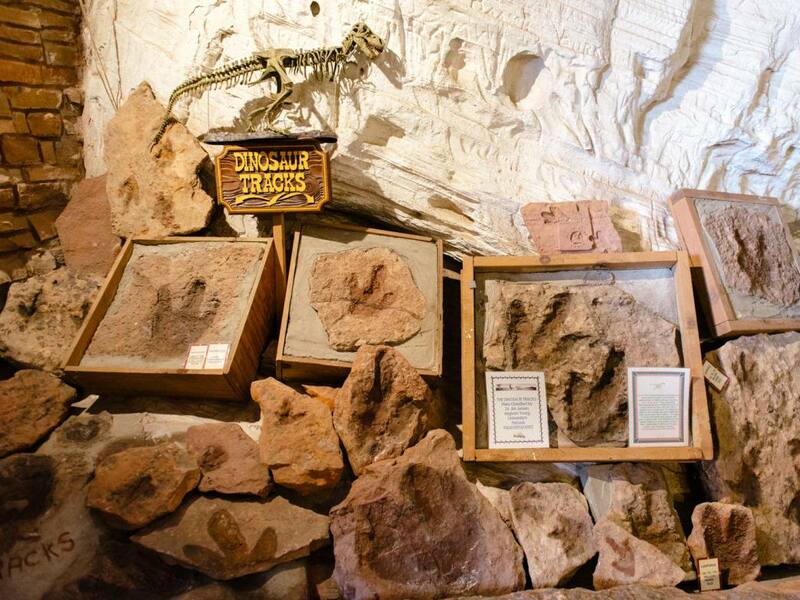 Once Chamberlain and his wife decided to stop the concerts, Moqui Cave became a gift shop and a museum to house his art and what would become on of the largest collections of phosphorescent fossilized minerals and rocks in the U.S. More museum pieces were acquired, including Native American artifacts; dinosaur tracks were found and brought in, and the Chamberlains began selling Southwestern art and goods. 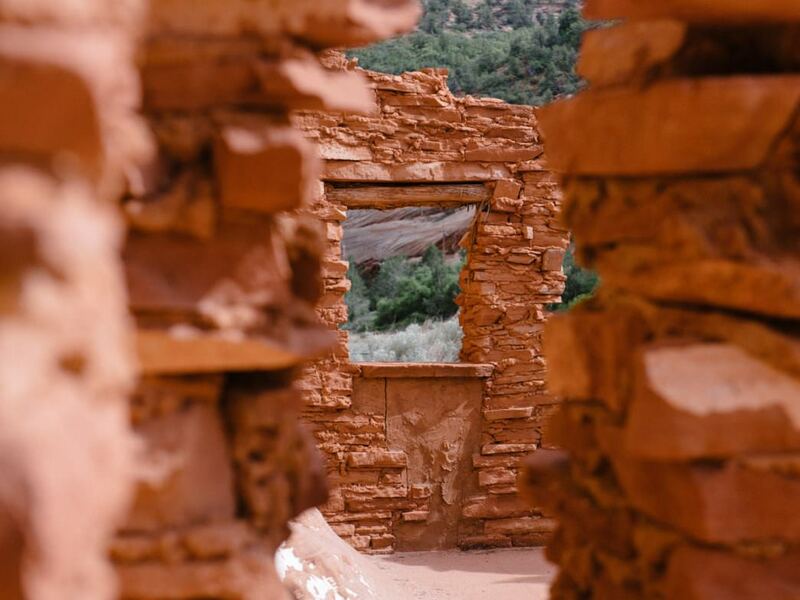 A gift store is still operational in a chamber adjoining the entrance, and offers items and gifts for sale, including Indian arts and crafts, kachina dolls, rugs, pottery, and turquoise. 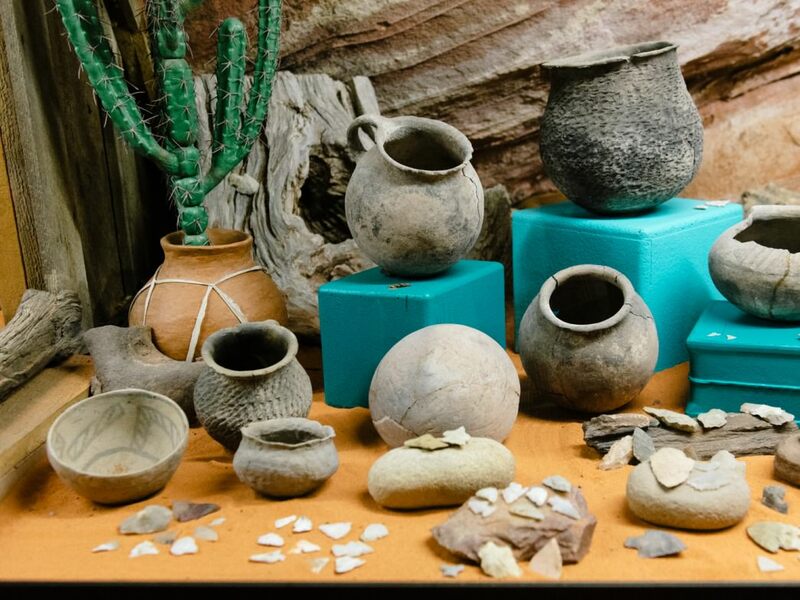 Now, Moqui Cave is run by Chamberlain’s kin, and many of the same relics can still be looked at and learned from. The cave is now sectioned off into three rooms. There’s the main corridor, where you enter and hear an oral history of the cave; another room has much of Chamberlain’s artwork and the still-standing bar; the third room is dark and lit with blacklights to illuminate the phosphorescent rocks and fossilized minerals. Visitors will learn of more recent history from the collection of records and photographs; these include information on the original United Order and the early-day life of The Church of Jesus Christ of Latter-Day Saints. Moqui Cave is truly one of a kind. 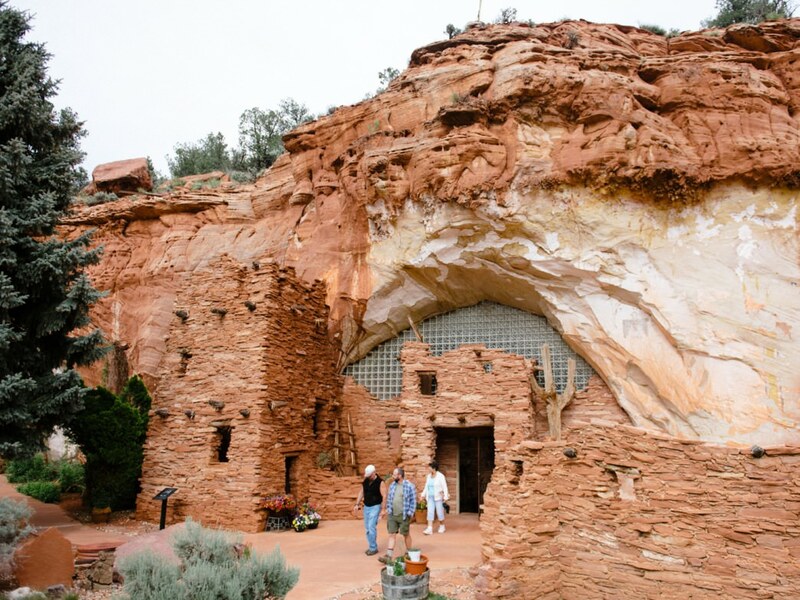 If you don’t remember the abundance of artwork by the eccentric former owner, Garth Chamberlain, then you’ll surely register the 1,000 arrowheads and other artifacts of the Ancient Ones as well as all the photographs of more-recent Southern Utah life. And then, of course looking at one of the largest fluorescent and fossilized mineral displays in the U.S. is quite impressive as well. Museum lovers, folklore fanatics, and the culturally curious. Moqui Cave also makes for an interesting diversion to add to the fun of your family vacation. Park in the parking lot in front of the building; it can accommodate RVs and buses. During the summer, Memorial Day to Labor Day, the museum and gift shop are open from 9am until 7pm Monday through Saturday. In the winter, check for hours and times of closure. Admission is $5 for adults with various price breaks based on age range. The cool, cavernous interior makes for a welcome sojourn from sweltering summer scorchers outside. Dogs are not permitted in Moqui Cave. For more information call 435-644-8525.